Prayer: Elisabeth Romanova forgave her husband’s murderer, gave up her royal status, wealth and possessions, devoted her life to serving the poor and sick as a nun, and died with the praises of God on her lips. Lord, grant us the grace to forgive those who hurt us, to give to those who need our help, and to praise you in every circumstance of life. Pray for us Elisabeth Romanova, Pray for us, all saints of God. Info: Elisabeth was the granddaughter of Queen Victoria and was born a German Princess. She married into the Russian Royal Family; her husband, Sergei Alexandrovich, was a deeply religious man and through his example, Elisabeth became a Russian Orthodox. Throughout her life, she helped those who were suffering and in the most need. She started a number of charities who worked within the churches of Russia and was head of the Woman’s Committee of the Red Cross who helped soldiers during war time with medical care, clothes and food. Her husband was killed during political unrest. After this took place, she decided to sell everything that was valuable and she set up a convent in 1909. In her new life as a nun, she would care for the gravely ill at night, and would work with the other nuns in the poorest areas of Moscow during the day. She also rescued lots of children from criminal areas of the city. When the political scene changed, and the Bolsheviks came to power, they did not like having the former princess around and saw her as a threat. They arrested her in 1918 and two months later, she was murdered. She was taken with a number of other prisoners on 17th July 1918 to an abandoned iron mine and hand grenades were thrown down to blow them up, but it didn’t work, because after the explosions, they started singing hymns. The prisoners’ bodies were not found until the 8th October 1918, still in the mine shaft. In her last hours, Elisabeth had used her nuns robes to bandage another person’s head. Even at the end, she was caring for the needs of others. Before telling the children about the life of Elisabeth, explain to them that the saint and martyr for today was a princess. Get them to think and explore what they understand a princess to be. Use examples from Disney films about how princesses are portrayed. Using a paper figure, get them to write or draw on one side, what they think of when they think of a princess (crown, nice hair, pretty dress, riches). Once they have done this, tell them about the life of Princess Ella (Elisabeth Romanova), about her religious beliefs and her charity work and later on, her becoming a nun. As the group what they think about this princess, does she match their picture? On the reverse side of their figure get them to write or draw what Princess Ella was like. Conclude by explaining that you can’t judge what people are like because of their circumstances. Just because Elisabeth was a princess and her husband was powerful, doesn’t mean that she saw herself as better than others, or removed from other people’s lives. She was a princess, but she wanted to help people, and care for them. She sold everything she had to help her do this, and that is why she is a saint. Using magazines, newspapers and pictures from the internet get the kids to cut out two sets of pictures. The first should be of people and others think makes our society great, for example celebrities, and beauty adverts. The second should be of people showing people are great by serving other people, for example charity adverts which show happy people getting food and clean water, or refugees finding welcome in a different country. Get the children to closely look at the faces of the people in the two groups. Which group looks happier and involved in what they’re doing? Tell the story of Elisabeth selling all her riches and dedicating her life to serving the poor. Would we remember her if she hadn’t done this great thing? Would she still be a person we can take example from? The story of Princess Ella works well with the story of the rich man asking Jesus how to get into heaven, Mark 10. 17-22. Ask the group ‘what do we use our hands for?’ Compile a list. When we’re young, adults will tell us what to do with our hands, ‘Don’t touch that’, ‘Don’t pick your nose’, ‘Wash your hands’. As we get older, we can decide for ourselves what we do with our hands. We can use them to do good or bad things. What are some of the difficult decisions that we have to make as children and as adults? Look at the story of Mark 10. 17-22, the rich man wanted to follow Jesus, and was obviously devout following the Law, but he loved his wealth and the stuff he had too much, and this stopped him from being able to follow Jesus. What stops us from following Jesus today? For Ella, although she was a faithful Christian while she was married, it was only after he husband died and she was able to get rid of all her wealth that she was able to dedicate her life to working for Christ in the poorest areas of Russia. Once she got rid of the things that were stopping her from doing this, she was able to live a great life, helping 100’s and 1000’s of people. Prayer: George Tankerfield took his stand upon the word of scripture, and bravely faced the flames rather than deny his own conscience. Lord. make us strong in the knowledge of your word, and teach us your truth, that we too may be faithful, and never fail you in the time of trial. Pray for us George Tankerfield, Pray for us, all saints of God. Info: By the reign of Queen Mary English history there had been lots of arguments and fighting because of religion. The reformation had taken place where Henry VIII had separated the official church in England from following the church in Rome and the Pope. The church in England had gotten rid of a lot of the practices of the Roman Catholic church that they felt was wrong and not in keeping with what Christ taught, and became what is called Protestant. However, now Henry VIII’s first daughter Mary was on the throne, she wanted the church to be reunited with Rome and was against all those who called themselves protestant. George Tankerfield was a Yorkshire baker and a protestant and is remembered most for standing up for what he believed in and not being afraid of speaking what he believed was the truth. At the time of his arrest, he was working in London. When questioned he said he didn’t believe in the act of confessing to a priest and that the sacrament of the Eucharist as it was at the time was too full of idolatry and was not in keeping with what Christ intended and that there were only two sacraments, Baptism and the Eucharist, others such as marriage, ordination, confirmation etc were not. He was taken away from his home and brought to St Albans and killed (burnt) at Romeland at the west end of St Albans Cathedral as an example for other protestant in 1555. From many of the people who saw him die, they said that they were sorry to see such a godly man burnt, and some praised God for his constancy and perseverance in the truth. Others said it was a shame he stood to such opinions and some shouted against him. Play a game of fact or fiction. Compile a list of fact and fiction questions for your age group. The idea here is simply to get the kids thinking again about true/false, right/wrong. Have them vote, guess, or however you want to structure it. Have fun. Get the kids to sit in a circle. Spin a bottle in the middle of the circle, whoever it lands on has to say something that is true. Play until everyone has had a go. This game is to introduce the theme of telling the truth. Sometimes it can be difficult telling what is truth today, especially with the internet where anyone can publish whatever they like, people are not always honest, and sometimes people don’t have all the facts to determine if something is truth or not. What sources of right and wrong could influence someone?
. Which ones are most common today? How do you determine what you believe? In the Bible there are over 200 occasions where the ‘truth’ is discussed. Have a look over and discuss some of these occasions when the truth is talked about, what impact do they have on us? If you were in the situation of George Tankerfield, would you stand up for what you believe in, or would you have told them what they wanted to hear (maybe with your fingers crossed behind you back)? What people like Tankerfield do is brave and takes more courage than most people have, and that is why they are remembered and why the church gives thanks for them. One day Emily went fishing with her granddad. Emily had a good time and was especially happy when she caught a fish. When Emily got home, she went to see her friend Danny. He invited her inside and took her into the kitchen, where he showed her a fish that he had caught. Danny’s fish was much bigger than the fish Emily had caught. Emily was happy for Danny, but she also felt disappointed. Compared to Danny’s fish, her fish was very small. She didn’t want Danny to know how bad she felt, so she told him that she went fishing with her granddad and caught a fish so big that she and her granddad had to use a net to help pull it in. Emily told Danny that her fish was much bigger than his. What did Emily do that was wrong? What should Emily have done? Explain that telling the truth is part of being honest. When we tell the truth, we tell about things exactly as they happened. Why is it important to tell the truth? You may want to ask the children to tell about times when they have told the truth. Prayer: Alban Roe preached the Gospel to his fellow prisoners with playing cards, and faced his execution with faith, courage, and cheerfulness. Lord, give us the joy that can shine through adversity, the grace to share our faith in good times and bad, and the hope to look death in the face, confident in your victory. Prayer for us Alban Roe, Pray for us, all saints of God. Info: Alban Roe was a Roman Catholic and a Benedictine monk. One of the things Alban Roe is best known for is working with cards. He often visited pubs and played card games (Maws or 45s) with the people he met there, having fun and making friends before telling them about Jesus. He lived at a time when it was illegal to be a Roman Catholic and so every day when he taught people about Jesus and the Christian faith, he was risking his life. One day, he was arrested and sent to prison for the work he did and was even locked in the Gatehouse in St Albans for a time before being sent to a London prison, and even in prison he found a way to teach people about the faith using cards. Cards are still used by many to teach people about the Christian Faith. Here is one way (this is not what Alban Roe developed, but the closest thing to it that young children could understand). Two: The Old Testament and New Testament in the Bible. Three: The Holy Trinity; the Father, the Son, and the Holy Spirit. Nine: Of the ten lepers whom Jesus cleansed, nine of them did not even thank him. Talk through the cards with your group. Then play a memory game to test how many they can remember. Give each one in turn a random card and they have to tell you what it represents. If they make a mistake, go through the cards again. How many times do you need to repeat it until they remember them all? • Can using cards be a useful way of helping us to remember important things about our faith? • What other aspects of our faith could you assign a card for? • What important things have been missed out? • Do you think Alban Roe helped people learn about Christianity through using cards? From the list above, make your own card and decorate it with its meaning. For example, you may draw out a Queen, and decorate it with a picture of Mary. Give each child in your group a suit of cards from a deck. Get them to decorate each one with an image that will remind them of something that number relates to from the bible or using the above pattern. (One deck of cards will go around 4 children, if you buy cards for this activity, please remember to claim the money back via the finance office). Explain to the children that Alban Roe often visited pubs because that is where he could find a large group of people, who didn’t know much about God, that he could get to know, and tell tem about Jesus. He often visited these places so that he could share what he knew with other people. As a group on lining paper, or individually on pieces of paper, draw or write some of the places you could go, to tell people who don’t know about God why he is so great. Follow up with the question, what are the most important things you would want them to know after talking to them about God? Today, the church celebrates the feast day of St Luke, gospel writer, doctor and patron saint to those in the medical professions. So when he wrote those lines from Jesus, ‘cure the sick, and say to them “The kingdom of God has come near to you” I’m sure he saw no problems. To me, half of that command seems a lot easier than the other. That’s half the work done, surely? So that just leaves me with, cure the sick. Being a doctor himself, for St Luke, curing the sick was a common occurrence, heck, without it he’d be out of a job. But as far as I’m aware, I do not possess any special gifts of healing. It would be quite cool if I did. I could walk around, laying on hands, perform some miracles. Regrettably though, I’ve not been able to speak to someone in a wheelchair and convince them to stand up and dance around. But this is the command that Jesus gives to the 70 odd as he sends them out to the villages and towns ahead of him. He doesn’t say, if you have the gifts, cure the sick. No, no, no. Jesus says ‘cure the sick, and say to them, “The Kingdom of God has come near”’. So there must be more to this. For many, Luke’s gospel is the cream of the crop when it comes to the gospel writers. He is a great story teller for one. Theological discourse is all well and good, but it’s the good story, told well that we remember and recall most vividly. And partly due to his skills in storytelling, Luke gives us a gospel that can directly challenge us, our culture and society today. And that is because, he deals in everyday life. The gospel he recounts to us, deal with human frailty, and family life. He speaks to the core of our engagement with the world. He brings to life, the holiness of our everyday lives. Chapter 10 of Luke’s gospel makes up his longest musings on the nature of mission and ministry, and becomes one of the foundational blocks for the churches mission for centuries to come. Go and act, go physically, practically and help them, and then tell them to word of God. Action & Word; the mission of the church. Neither fully bring people to God when they stand alone. How helpful is it really, to tell the family struggling with mounting debts, or the recently bereaved, or the homeless person in need of a hot meal that the Kingdom of God is at hand? Simply telling them doesn’t do very much. And likewise the other way around, acts are lovely and helpful, but if the recipient doesn’t know that you work for God, how will they ever know where to direct their praise? Action and word go hand in hand. Without special, specific, gifts for physical healing, we need to find another way that this command works. But the one thing I do know, is that all of us in this world, in varying degrees, and at particular times in our lives, are sick. We are all sick, and we are all in need of healing. And our illnesses come in a wide myriad of different forms. From coughs and colds, to illness’ that debilitate us. Loneliness and isolation, even when surrounded by hundreds. Depression. Despair. The inability to switch off, even in times of holiday and supposed rest. That feeling that sits in the pit of your stomach when you’ve done wrong to another, and that feeling that injures when another has wronged you. Our illnesses can take more forms then we can count. And Christ has come to heal every one of them, and restore us to his image again. A news reporter wanted an exclusive story on his pit. A government official asked if he was paying taxes on the pit. Jesus, seeing the man, took him by the hand, lifted him out of the pit and said go on your way! Action and word is the work of this church. And if we are truly the body of Christ in this world, then this is our work. We all fall in pits from time to time. What counts is what we do to help get each other out. And for any of you who feel in the pit, after this service there is a time of anointing and prayers for healing in the shrine. Jesus said, ‘cure the sick, and say to them ‘the kingdom of God has come near.’ Yes Lord. Amen. Prayer: Oscar Romero spoke out against poverty, injustice, corruption, state torture and murder in his own land, and was shot as he offered the Eucharist, uniting his sacrifice with Christ’s. Lord, as we receive your Body at the altar, send us out to live as your Body in the world, and by the power of your Spirit and the prayers of your martyrs make us faithful witnesses for you. Pray for us Oscar Romero, Pray for us all saints of God. Info: Oscar Romero (August 15 1917 – March 24 1980) was a Roman Catholic priest in El Salvador, and became bishop and archbishop of San Salvador. He worked hard especially for the poor and for those who had been caught up in the civil war. He is often spoken about in the same lines as Mahatma Gandhi and Martin Luther King Jr due to his belief in non-violence. He was killed during a Eucharist service shortly after the sermon, and his death provoked an international outcry for human rights reform in El Salvador. he started learning about the religious life when he was 13 and started studying theology when he was 20. 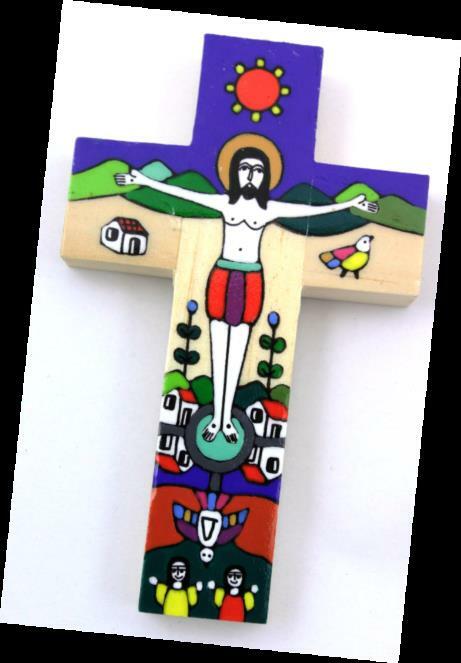 In El Salvador, there is a tradition of producing colourful crucifixes. The bright decorations have a figure of Jesus at the centre but also include images of the local community set in a Salvadoran landscape. They have become known as Romero crosses in England and Wales and we have one in the crypt of the Abbey. Design your own cross. Include drawings of the cathedral, your school or other areas of the community. Think about the background landscape, colours that reflect your surroundings and which aspects of your community’s life to include. This could be said by a leader or a young person/ divided between the young people. For an activity on a large piece of paper, or lining paper, this prayer could be illustrated by the young people following a discussion about Romero’s life and death. and struggled against injustice in El Salvador. Like you, he remains in our hearts. in solidarity with those living in poverty. Oscar Romero is known for his work among the poor and for speaking out for social justice. This activity helps the group think about how our society views poverty and to see where the voices are speaking up for the poor. The second group is given printouts of some bible passages (see below). Ask them to think of a word that describes the actions or attitude of each person who experiences poverty and highlight the descriptive words used. Reflect with the group and ask if there is ask if there is anything they notice about the newspaper articles or biblical stories. Why are the descriptive words we use about people who experience poverty so important? How might changing the language we use influence our attitudes and behaviour? Invite both groups to stick their articles/passages onto three sheets of flipchart paper, one showing positive stories/words about people experiencing poverty, one of negative stories/words. for a fire. “Would you please bring me a cup of water?” he asked. As she left to get it, he asked, “Would you also please bring me a piece of bread?” The widow answered, “In the name of the living Lord your God, I swear that I don’t have any bread. All I have is a handful of flour and a little olive oil. I’m on my way home now with these few sticks to cook what I have for my son and me. After that, we will starve to death.” Elijah said, “Everything will be fine. Do what you said. Go home and prepare something for yourself and your son. But first, please make a small piece of bread and bring it to me. The Lord God of Israel has promised that your jar of flour won’t run out and your bottle of oil won’t dry up before he sends rain for the crops.” The widow went home and did exactly what Elijah had told her. She and Elijah and her family had enough food for a long time. them, “Come with me! I will teach you how to bring in people instead of fish.” At once the two brothers dropped their nets and went with him. Of Oscar Romero, Pope Francis said ‘His ministry was distinguished by a particular attention to the most poor and marginalized.’ He was a voice for the voiceless poor. In our world, not everyone has fair chances or the ability to speak up and this world can seem very unfair, with lives lived out more by chance. 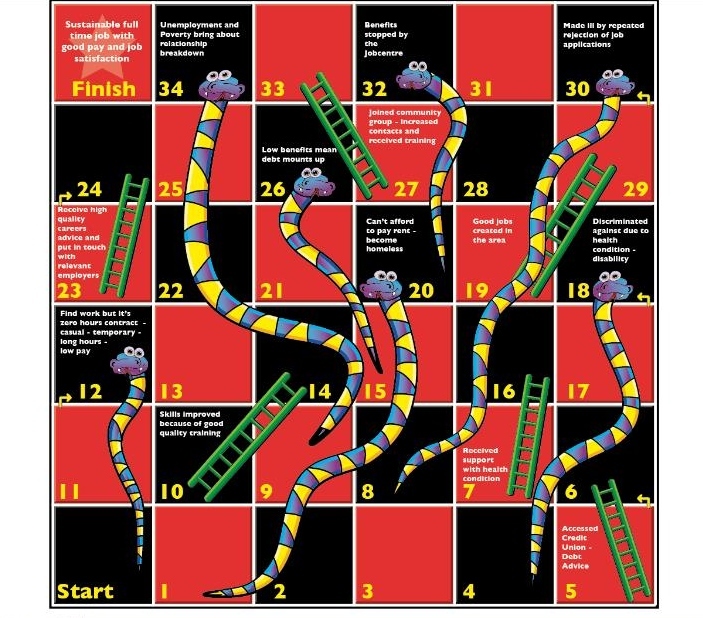 The game Snakes and Ladders can be used to illustrate this. Allow the group to play a game or two (depending on time – you may need to stop them half way through a game). When all have played, ask the group these following questions. What does this game have to say about social mobility and the barriers people face in trying to work their way out of poverty? What does this game say to us about the connections between poverty and injustice? We meet in the name of the Father and of the Son and of the Holy Spirit. Amen. It’s good to see you this morning and thank you for bringing all your gifts of tins, and packets and all the cakes and bread you’ve made. Would you like to bring them up to the altar?? Harvest is the time of year where we give a big, special thanks to God for all the good things he has given us to eat and which help us grow and be strong. I have a story for you this morning, but I need you to do some actions, can you pretend to be, flying things, and swimming things, and crawling things and jumping things? (Let them practise these actions). End by emphasising that God made everything for us to enjoy and for us to look after and that it’s part of our job to look after the world and you’ve done a wonderful thing by bringing so much food that will feed people without food. That our Lord Creator brings. For the wonders of the world. End with some prayers by getting the kids to tell you their favourite food. We thank you God for strawberries. We thank you God for cereal. We thank you God for chocolate. We thank you God for pizza. Etc. Blessing: God give you every good thing to make you grow strong and healthy, and the blessing of God almighty, the Father, the Son, and the Holy Spirit, be with you all, evermore. Amen.